RUSTON, La. (AP) DaQuan Bracey scored 17 points, Anthony Duruji grabbed 11 rebounds and Amorie Archibald handed out 10 assists, matching his career high, to lead Louisiana Tech to a 62-50 victory over Western Kentucky on Saturday. Reserve Ra'Shawn Langston pitched in 15 points for the Bulldogs (15-7, 5-4 Conference USA), who handed preseason favorite Western Kentucky its fourth conference loss. The Hilltoppers (11-10, 4-4), who came in with three C-USA losses by a combined five points and sporting a three-game win streak, got 11 first-half points from Jared Savage and took a 28-21 lead. The second half was a different story. Savage failed to score, WKU sank just 6 of 22 shots (27 percent), including 0 of 5 from distance, and the Hilltoppers failed to make a basket over the final 7:32 of the game. Western Kentucky's super freshman Charles Bassey had another stellar game. Bassey scored 16 points on 4-of-5 shooting from the floor and an 8-for-8 effort at the foul line and grabbed eight rebounds. Bassey came into the game leading C-USA with nine double-doubles. 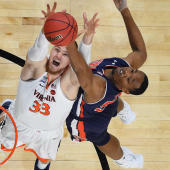 He was also leading the conference in shooting percentage (63.5), rebounds (195) and his league-leading 47 blocks were more than the total of 68 Division I teams. He didn't have a block against Louisiana Tech, which remained unbeaten at home this season.